1. Clean the fish and cut 1-2 slits on each side of fish. Add ¼ turmeric powder and ½ teaspoon salt with fish and coat it properly. 2. Heat the pan with oil on medium and fry the fishes about 8 minutes each side or till fish is cooked. 4. In same pan add onion and green chillies fry it till it become light golden brown. 5. Add onion paste, chilli powder, turmeric and salt. 7. Add coriander leaves and stir it.Turn off the heat and pour it over fish. 8. 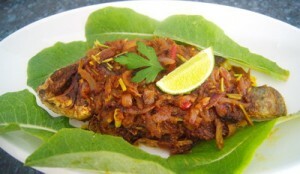 Serve spicy Tilapia fry / tilapia dopiaza with hot plain rice. I am blessed to find this blog! So many typical Bengali dishes are described in such a great details. God bless you! I am falling heavy on my partner now as I nag for a typical Bengali dish everyday. Thank you for running this blog. thanks for your good words. it means a lot to me.